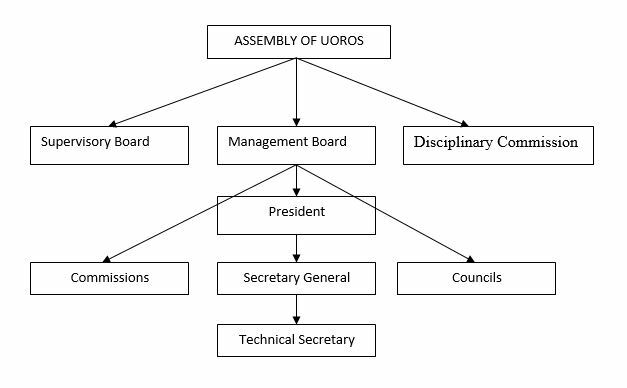 Associated organizations are governing the Union through its authorized representatives, elected and appointed bodies in the Union and its working bodies. The authorities of the Association are the Assembly, the Management Board and the Supervisory Board. Associated organizations in accordance with its statute, elect, appoint apropos determine, or delegate a representative as a member of the Assembly of the Union. The Assembly elects the members of the Management Board, Supervisory Board and Disciplinary Commission. Bodies of the Union may form their own commissions, councils, teams and other working groups (hereinafter referred to as the working bodies) to perform certain tasks within its competence. The mandate of the Union’s bodies and their working bodies is 4 years with the possibility of re-election.